I don't think I've seen previews for this anywhere but I got the pictures and info from the Color Club website. BOLD COLOR and GLITTER DETAIL together. Brush on our “STARRY TEMPTRESS” TOPCOAT for MEGA-SHINE and extra TWINKLE!" 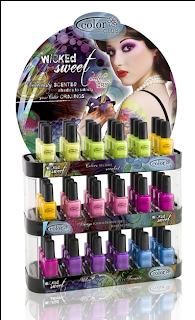 "Color Club serves up Wicked Sweet, a LUSCIOUS collection of VIBRANT COLOR. 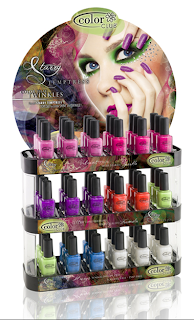 Once DRY, these fun, DELICIOUS SHADES Become FRUIT SCENTED and totally irresistible!" NEONS! I looove neons, and now glitter neons and scented neons?? Sooo excited for this! They are already available at 8ty8beauty.com, but I am hoping I will be able to find them at my local Ross soon! Who knows, though, I might just end up taking the plunge anyway! I'm not a big fan of neons but I do like fruity scented stuff. LOL!